When life gives you lemons....be happy! - Stop staring and start sewing! 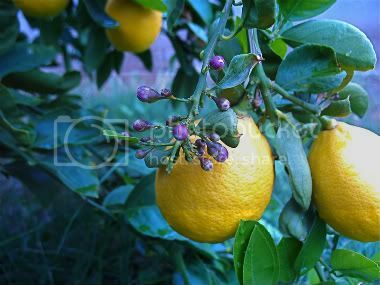 When life gives you lemons....be happy! Sorry for the long absence. As if getting ready for Christmas wasn't enough, we got hit with some sort of (flu?) bug and I was holding out okay until Skate had a night of barfing/fevers. I was really happy that I got him into the bathroom as soon as I realized he was going to throw up. It's so much easier to clean tile than carpet, isn't it? After our bath (we both got splattered, ew) I stayed up all night with him (we got to watch Monsters, Inc. at 2:00 in the morning which was kind of fun) and that was the last straw for my immune system. But finally we are all on the mend here if you don't count a couple of sniffly noses (sniffles I can handle). I haven't done much sewing with everything going on and my sewing room is so messy right now that it's hard to be inspired. But I have done a little Christmas cooking and it was so nice to be able to pick some ingredients straight from my backyard. I've been trying to nurture and baby my lemon tree this year and I'm so pleased to finally have a nice little bumper crop. Here is a picture I took in July when I knew things were looking hopeful. And here is a picture from today. 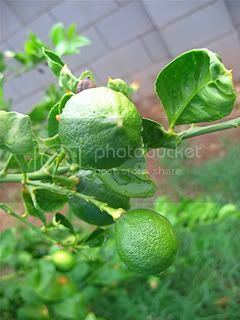 I have around 50 lemons. Last year I had only 16. It's already starting to blossom for next years crop and when the blossoms open the smell is just heavenly. Isn't this pretty with the yellow and purple together? We're actually getting a freeze tonight so I need to go put a sheet over the tree before bed. I have to share a picture of one of the gifts Olivia made. 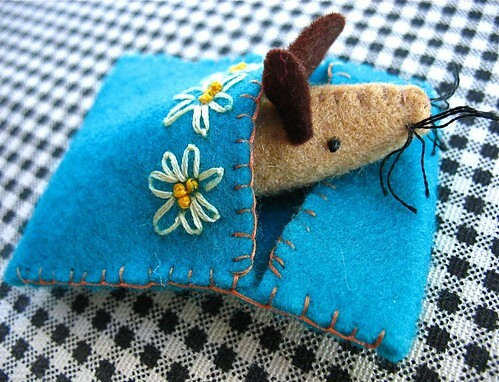 She stitched this sweet little mouse with it's own sleeping bag for Sofia (and it was very well received). So adorable. I love his wacky whiskers. I've had a lot of people ask if I will be getting more of Tanya Whelan's wonderful Darla at Fabritopia and yes, I will (and I'll re-stock David Walker's Robots too)! Darla's such a beautiful collection and it's been selling so fast I haven't had time to play with it. But I'm realizing that it blends beautifully with some of the prints from the Ava Rose line (especially the dots and damasks) so the possibilities are crazy. And it looks like I'll be getting Jennifer Paganelli's Flower Power in early January (I was hoping it would come this month but it's definitely the next one up at least). I'm also expecting Flights of Fancy (yay Paula!) and Good Folks (and I'm hoping I can squeeze some of Patty Young's beautiful Andalucia in too) in January. So January is stacking up pretty good already! My 15% off "shelfspace08" sale ends at the end of the month (or should I say "the end of the year"?) so don't wait too long (especially since Pop Garden and Bell Bottom are both marked down right now!). I hope everybody enjoyed a wonderful Christmas (and Hanukkah!) with your loved ones. Our families have been snowed in for days up in Oregon (I think the snow lost it's charm some time last week) so we are grateful for just a little chill and a little rain here in Arizona.